SINGAPORE - Many think of social work as a demanding job with long hours and low pay, compared to other professions. And they would be right, said Ms Teo Swee Ngim, a senior medical social worker at SingHealth Polyclinics. It can also be challenging at times, said the 36-year-old, who has been in the counselling role for the past decade. She recounted how an irate man showed up at her office one day, screaming and hurling accusations at her of sowing discord. She had counselled his wife, who was assigned to her in a domestic violence case. "She went home and told her husband about it. When he showed up at the office, he shouted at me. I was quite shocked and felt intimidated. I did not expect that. Thankfully, my colleagues stepped in." But what keeps the single woman in the profession is the conviction that she should help those who are less fortunate. It is also because she was once helped by a medical social worker, who counselled her for eight months after she developed severe acne vulgaris at the age of 23, a condition where her face was covered with pimples filled with acne and pus. She remembers not wanting to leave the house or meet her friends because of the way she looked. The experience, she said, would have scarred her emotionally, had it not been for the social worker who gave her more information about the condition and advised her on how to cope. "I was very upset and kept thinking if I would recover. He gave hope and assurance at the time I was so down... he kept telling me that it was just (an) interim (thing). I think it helps to talk to someone who has seen similar patients," said Ms Teo. She and other social workers and social service practitioners here will be recognised for their efforts at the annual Social Workers' Day today. The day was launched in 2007 to pay tribute to social workers. 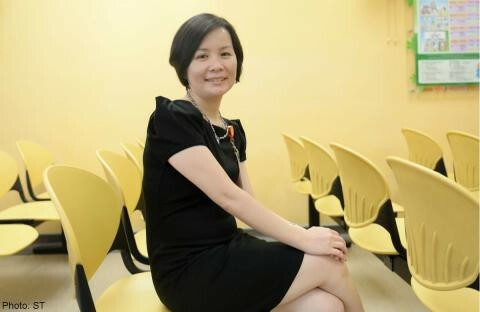 Ms Teo is one of 1,400 registered social workers and social service practitioners here. But 130 more are needed every year for the next three years as the population grows, according to figures from the Ministry of Social and Family Development. Advice from veterans like Ms Teo: The job is not a bed of roses and social workers need to manage the expectations of their patients. "Some patients expect their problems to be solved and they blame you for not helping enough. That can be quite demoralising. We are only human," said the social work graduate from the National University of Singapore. She also recounted her experience as a social worker at the Children's Cancer Foundation. "I would journey with the family from the onset of the diagnosis. But for me it was a struggle. Facing the demise of children is very painful." Ms Teo left the foundation in 2009 after working there for three years. Now, she alternates between polyclinics at Bukit Merah and Queenstown where she deals mostly with elderly patients with chronic illnesses. She also appealed to those interested in joining the sector to look beyond the pay. "When I first started working as a social worker, my starting pay was only $200 more than that of a diploma graduate," she said, adding that the job can also be emotionally draining. "You have to be an active listener, and at the back of your mind, you also have to think of how to help them." But she said the pay-offs are priceless. "You get to help and listen to the stories they share. Many of the patients are elderly but they are very resilient despite their situation. I learn to appreciate my life too. This is something you do not get to see unless you are in this profession."